The target readership of this book which explores mysterious and strange real life occurrences is readers aged 10 to 14 years. It addresses the question which has been debated for decades: are we really alone in the universe? 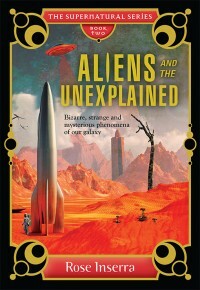 For others interested in unidentified sightings and in the unexplained, author Inserra, an expert in metaphysics, explores a wide range of strange phenomena, asking such questions as whether or not our ancestors have connections to galactic visitors and why famous ancient sites are built on ley lines and how they might connect to extra-terrestrials. Quoting the story of the lost continents of Atlantis and Lemuria, and other ancient sources, Inserra suggests that aliens bred with sub-human beings to produce modern man. How to explain the advanced technologies evident in the building of Pyramids and the giant statues of Easter Island, for example? The only aspect of the book which seemed to be unsupported by clear evidence is when Inserra writes about the many varieties of aliens which exist, ranging from the Pleiadeans (blond Nordic humanoids or brunettes) with super technology to the Draconians, muscular and dragon-like who are terrifyingly tall and corrupt and brutal. Other alien species mentioned include the Greys, the Nordics, Lyrans, MIBs, Arcturians and Sirians. If you want to know UFO hot spots around the world, the book names them, and also gives examples of dates and places of claimed alien abductions. In this fascinating and easy-to-read book, there is a wealth of information which cover unexplained phenomenon such as crop circles, the Bermuda Triangle, time travel quantum physics and more. Perhaps our ancient ancestors did have connections to galactic visitors and modern man does have alien DNA (this, suggests Inserrra, would explain the ‘missing link’ of Darwin’s theory). The book is well-designed with headings, sub-headings, break-out boxes, and really interesting photos some of which show art depicting UFOs. In The Crucifixion painted in 1350, a UFO is shown in the sky (a man sitting inside a sun-like capsule), and there are two other photos of artwork showing UFO-like features in works painted in the 1500s and 1600s. Children who are intrigued by the idea of aliens and who enjoy a good read are likely to become totally absorbed by the wealth of stories in this book. They are also likely to walk around trying to convert others to the fact of life beyond Earth. And, too, they might like to follow up their reading by referring to the bibliography of books, magazines and websites at the end of the book. Aliens and the Unexplained with stories of bizarre, strange and mysterious phenomena of our galaxy is the second in The Supernatural Series, the first being Witches and Wizards by Lucy Cavendish.